The Magyars were the first people to document the Vizsla breed being used in pointing and retrieving efforts during hunting. The Magyars were a culture who had to defend themselves against predators and ensured their existence by using animals in defense. The Vizsla breed is named for the Hungarian word meaning "pointer," the dogs are very intelligent and their ability to point and retrieve made them valuable. The Magyars were threatened by invading forces from Turkey and were under constant attack. They selected the mountains of present-day Hungary, because they were protected and shielded through the entire region. 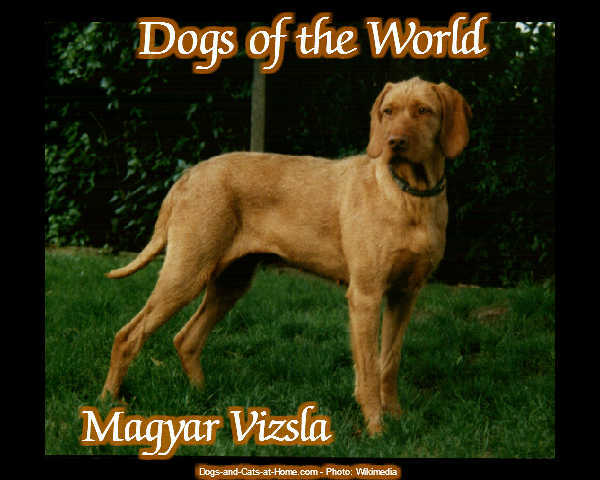 With the Vizsla's great sense of smell, the Magyars continued to thrive and survive off of the food they caught in the rough terrain. Many years later, the Vizsla breed became well-known in present day Hungary. The dog had been common in areas like Transylvania where they were able to remain a pure breed. It was during the World Wars that the dog became mixed with other breeds and some different variations came about. In the 1800's the Viszla was almost ran out of its own breed class, due to an influx of English and German Shorthair Pointers. There are theories about these breeds, along with the Weimaraner, that were used in the 1900's to resurrect and cultivate the Vizsla breed. It is simply a theory, there is no concrete evidence to confirm or deny the hypothesis. The Vizsla and Pointer breed share a definite resemblance from the sharp, pointy nose to the thin and erectly pointed tail. The game flushing skills of the Vizsla are only rivaled by the Pointer. When Communists overtook Hungary, they wanted to eliminate everything from the Hungarian culture. The Vizsla breed all but nearly vanished to the point of extinction, though the hunting skills of the Vizsla is what resulted in the dog begin saved. High ranking officials of the Communist party loved hunting for deer and rabbit; a few Vizsla remained, but were denser in body structure. While in Hungary the dog become popular for use in hunting rats. During the 1950's, the United States became aware of the dogs search and finding abilities and the Vizsla was imported. The dog became used for game hunting soon after arriving in America; it was used to retrieve fowl, rabbits and deer. The dog eventually became as popular in Australia as it was in America. Today, there are competitions held around the world to celebrate the Vizsla dog breed and its many talents. This article was written by John Jackson and has been contributed by http://www.greatdogsite.com. For more information on the Vizsla, please visit our page http://www.greatdogsite.com/breeds/details/Vizsla/.